Practice tests are an excellent way for certification candidates to prepare for taking exams, and the well-crafted questions and detailed answers you'll find inside will help give you the confidence to succeed on exam day. With 100% coverage of Exam 220-901 and Exam 220-902 objectives from hardware and networking to mobile devices and Windows operating systems, CompTIA A+ Practice Tests help you gauge your readiness — and hone your test-taking strategy — well in advance of exam day. Designed to measure a candidate's competency with various hardware components and software operating systems, the A+ certification is the most popular entry-level IT certification around. 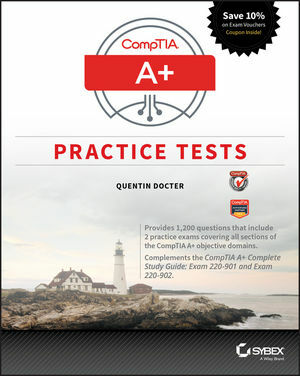 CompTIA A+ Practice Tests provides nine unique practice tests—totaling 1,020 questions—that cover the nine CompTIA A+ objective domains you'll encounter in Exam 220-901 and Exam 220-902. Plus, the book includes two additional 90-question practice exams (180 questions total). That's 1,200 practice test questions in all! You will also gain access to the Sybex interactive learning environment where you have access to all questions, and can create your own practice tests based on areas where further review is needed. Practice tests are among the most effective exam prep tools, practice with Sybex so you can be confident on exam day. Quentin Docter, A+ and the other certifications from CompTIA (including IT Fundamentals), Microsoft, Cisco, Novell, and Sun Microsystems, started in the IT industry as a tech support agent for Packard Bell in 1994. Since then he has worked in tech support, network administration, consulting, training, web development, and project management. He is the author of several books, including the CompTIA A+ Complete Study Guide and CompTIA IT Fundamentals Study Guide by Sybex, an imprint of Wiley.